Today was nice and sunny and the snow is starting to melt. And even better, the files have been uploaded to the printer! Please be patient with me as the magazine works its way through prepress, proofing, printing, binding, inserting, mailing... It will be a few weeks yet before this issue is complete in all its print glory. In the meantime, please subscribe/renew so that your name will be on the master mailing list and you'll be first in line to receive it. Food provides us with so much more than basic survival. From harvesting your own vegetables, shopping at the local farmer’s market or cooking a homemade meal—the day-to-day involvement in the gathering and preparation of food can be delicious and fun. For many, though, a love of food is taken to other creative levels. Through packaging design, food-inspired photographic pursuits, gardening, sumptuous cookbooks or even blogging about what you just ate, we celebrate your passion for the edible. We hope to whet your creative appetite with this food and gardening-inspired issue! Also coming up: Work/Life 2 is now shipping and the book launch is slated for April 7 from 5-9pm as part of the First Thursday celebrations. Lisa Congdon's A Collection a Day will be shipping in April but when exactly is still to be determined. Soon! Tif Fussell is off visiting her English homeland, but I have the pleasure of reading through her first draft of the Suitcase Series Volume 2: dottie angel while she is away. Tif and I are both very excited that Emily Chalmers will be penning the foreword! I've just purchased Emily's latest book, Modern Vintage Style, and can't wait to spend time with it. 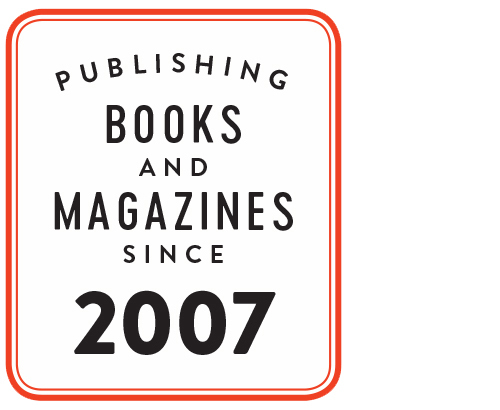 Each and every book and magazine issue is a deeply personal experience for me. I put everything I've got—and then some—into creating things that I am proud to publish. The year so far has tested my abilities and energy on all fronts with two books and two magazine issues to complete in the past four months! Working from home has meant fitting projects in between the activities of motherhood. My baby is now one and quickly switching gears into toddlerhood... there's a lot manage around here. Thank you to Glen for being so helpful and letting me head down into the basement to get things done. You make the impossible possible. With issue 9 off to production and (hopefully) a bit more time to breathe, I look forward to springtime with my family. I'll still be a busy bee—it's just my nature—but I plan on making time to smell the flowers.